This Geometry Vocabulary Game is a fun way for students to review math vocabulary terms. This game is suitable for middle school students and upper elementary students. This activity can be played on computers, iPads, and other tablets. You do not need to install an app to play this game on the iPad. Have fun learning important geometrical terms and definitions! CCSS 4.G.2 Classify two-dimensional figures based on the presence or absence of parallel or perpendicular lines, or the presence or absence of angles of a specified size. Recognize right triangles as a category, and identify right triangles. CCSS 5.G.3 Understand that attributes belonging to a category of two dimensional figures also belong to all subcategories of that category. 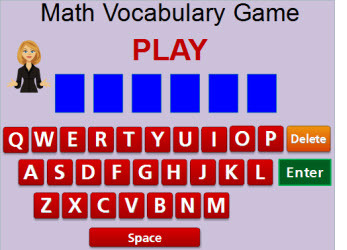 Return from the Geometry Vocabulary Game to the Middle School Math Games webpage, or to Math Play.